Cedar Rapids Metro Economic Alliance :: Election Day is Over - What's Next? The 2018 elections are over. So now what? Our advocacy work begins to rev up! We worked over the summer and through the fall to gather information, seek feedback and develop our public policy priorities for 2019. That process is nearing completion and will be shared with our members and policy makers before the year’s end. We focus our priorities around three concepts – building our workforce, improving our business environment and enhancing our communities. With those ideas as our foundation, we develop and support policies that back our priorities and help us achieve success. While our policy priorities remain consistent, the strategy and finesse to achieve them in-part hinges on which political party controls the legislature and governor’s office. Now that we know those outcomes, our true strategy work can begin. One of the most important pieces of that strategy involves you, our members, speaking directly with legislators. One of those ways is to arrange opportunities for you to speak directly with policy makers and talk to them about the issues that matter most to our community. Next month you’ll begin seeing our 2019 public policy priorities that are based on feedback from our members. 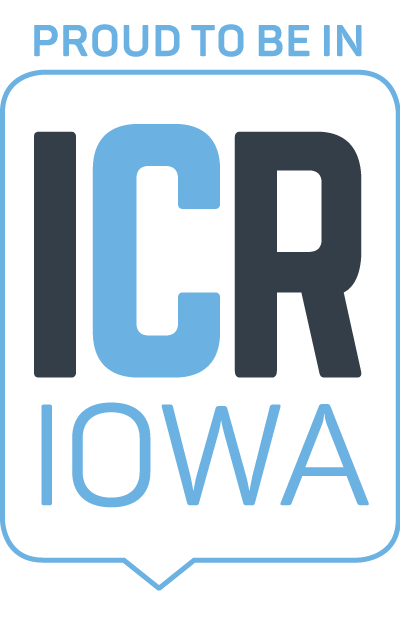 We’re hosting an ICR Legislative Launch on December 13 with our partners at the Iowa City Area Chamber of Commerce, open to members of the Economic Alliance and the Chamber of Commerce. The legislative session typically runs from January to May, and in that time, we will host three public policy events designed to involve you directly in advocating the public policy priorities we lay out for the business community. One of those events is called Policy on the Rocks. These legislative receptions give our members a chance to interact with lawmakers in a causal setting. Save the date for the two upcoming Policy on the Rocks events on February 1 and April 5, 2019. If you nervous to attend a public policy event, don't be! We always send you talking points and list of what legislators have RSVP'd ahead of time. On March 26, we will again team up with the Iowa City Area Chamber of Commerce for the annual ICR Iowa Day at the Capitol. Alongside a delegation of members, we travel to the Iowa State Capitol for a day advocating on legislator's turf. To stay in-the-know all session long, our Public Policy email updates are incredibly value. We send the emails during session to provide an analysis of how our priorities are faring and how you can join in our efforts. Sign up for those here. We hope you'll stay involved in public policy advocacy well past Election Day; this will likely prove to be an incredibly important legislative session, especially for our state. Our unified voice is the key to our success.